You go off too fast. Despite the relatively short distance of many duathlons (ours included), they can be a rather painful affair if you pace poorly. Aim to finish the first run with plenty in the tank for the bike and second run. There’s nothing worse than hitting two wheels and within moments knowing your legs are shot. Although it’s difficult to execute, aim to run the second leg faster than the first (assuming they’re the same distance, of course!). You forget where you racked your bike. We’ve all been there. Flying into transition having nailed a great run, but you’ve absolutely no idea where your bike is. Cue panic stations, ruffled feathers and stressy-outbursts. Even if they’re racked in number order, do a ‘walk-through’ from entry to exit before the race and take note of markers around you to help you locate your bike. You decide today is the day to attempt a flying mount. Running with your bike over the mount line and hopping on in one fluid motion certainly makes for a rapid transition time. But we’d encourage you to practice this before race day. Some make it look easy (it’s not) but we’ve seen it all: an overly eager “hop” right over the bike, leaving you in a heap on the opposite side; painful saddle landings onto delicate bits; running too fast and not getting your leg over in time; not going fast enough and coming to a standstill before you’ve got your feet in the shoes / onto the pedals. It’s a hazardous game this, so give it a crack (on a quiet road) before race day. You decide today is the day you’re going to attempt your first flying dismount. Well, rather like #3, a flying dismount can be a thing of beauty and certainly impact your overall time. But, again, we’ve seen it all and this is where most accidents happen. Coming in way too hot into T2, dismount line approaching all too fast and you’ve still got one foot attached to your steed. Oh dear! Spectators shudder, family members pretend you don’t belong to them and you’re left to pick yourself up and sheepishly trot into T2. So please, practice this and show us all how it’s done in the event. You end with a sprint finish. A sprint finish sure does look good and it might leave your proud kids thinking you’re a superhero for coming in so strong, but chances are it this means you haven’t quite given it enough effort during the rest of the race. Finish strong, but try to hit the whole of that second run hard. It’s a tough gig running off the bike, but your time will be considerably faster if you push the whole way rather than only sprint the final 100m. You sit down immediately after the finish line. Your legs will be toast at the end, but we’d urge you not to collapse in a heap immediately. Not only does it give our volunteers bad backs having to scoop up sweaty bodies, but more importantly you’ll stiffen up very quickly. A duathlon, perhaps even more so than triathlon, is tough on the legs and the shock to the system will result in a few muscles tears! If you can walk around for 10 – 20 minutes at the finish, this will pay dividends the following day when you’re trying to descend the stairs backwards. 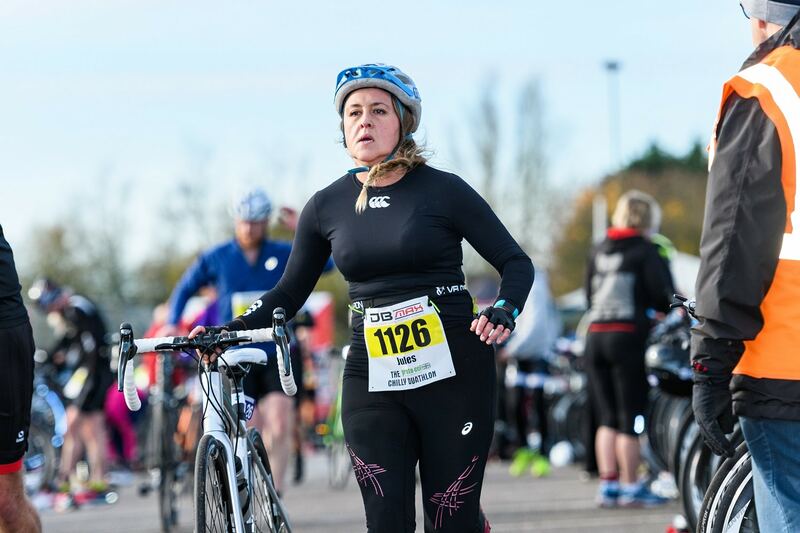 If you’re feeling ready to take on your first duathlon, our Summer Chilly duathlon on 5th September and Winter Chilly Duathlon on the 18th November both still have spaces so sign up here!